Hmmmm. I remember another fictional little boy who liked to climb to high places. It didn’t end well. Are you referencing Jack and the Beanstalk or something else? i havent commented in ages, but wow Arne is a cutie!! Haha, yay! Glad you think so. Aha, a fun trick you have pulled upon your readers with that play on perspective on previous page. 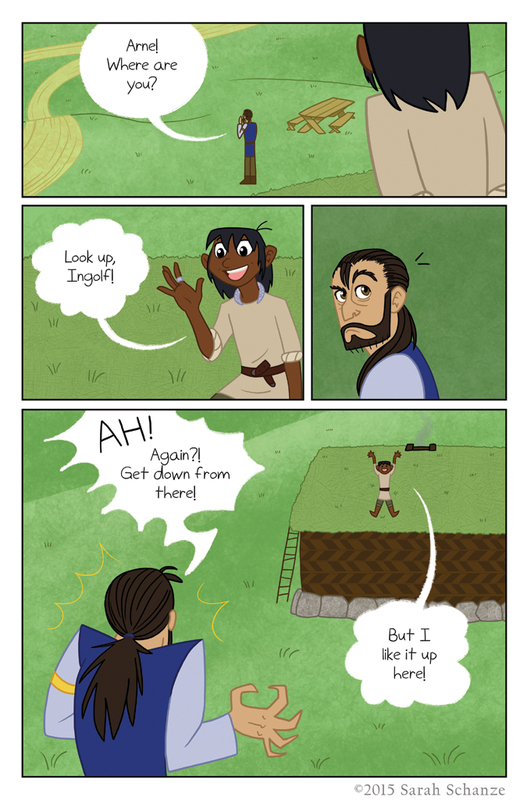 A dark-skinned boy in medieval Iceland? How did that happen???? Arne is a cutie-pie, he developed differently from what I was expecting but I hope the readers like him as much as the other characters! What’s up with the kid’s race? The comic’s time frame is not exactly a period known for immigrants, so that quite stands out. Way darker than the already exaggerated skin tone of Arabs. Not known for immigrants? That’s exactly what the Vikings were, my friend! They immigrated to England, Scotland, Ireland, Iceland, France and mainland Europe, not to mention Greenland and North America (tho that one didn’t stick). They didn’t just go raiding monasteries along the English coast. After a while they also brought their wives and children with them to settle into new homes. Arne’s background and how he got to where he is now will be explained in later chapters, worry not. Thanks for reading! I think in an earlier comment you mentioned that Arne is of the Dorset culture… so that would make him a skraeling? Or would they have been further south? He is from the Dorset culture, and yes he is a skraeling! He is from “Helluland” which was a part of present-day Canada west of Greenland. “Skraeling” was a general term the Vikings used to describe all Native Americans they encountered, no matter where they were from.